The regulation of gold in Japan began in 1931 and the Gold Control Act was fully revised in 1953. There were new developments from April 1973 in the form of gold import liberalization, triggered by US President Richard Nixon’s announcement in August 1971, whereby the direct convertibility of the United States dollar to gold was cancelled. This was the beginning of the popularization of gold and the transition from regulations that had continued for over 40 years. At that time, export of gold had not yet been liberalized, so selling to domestic customers were the only means of sales. However, major changes took place in the Japanese gold market due to the liberalization of imports, which made it possible for people to obtain gold freely. A temporary gold boom occurred as a result of sales competition by department stores, such as their so-called "Gold on Sale." Directly after the liberalization, a record was set for an import volume of 34 tons in just one month. Individual consumers also came to purchase gold bullion from our company. However, as we did not carry out extensive PR activities at that time, this was limited to passive sales. There was a significant risk because, if the price of gold suddenly rose and those consumers all switched suddenly from buying to selling, precious metal merchants, including Tanaka Precious Metals, would not be able to sell overseas due to export controls. Therefore, it was impossible to guarantee the purchase of gold from customers. The full liberalization of gold transactions took place in April 1978, five years after the import liberalization of gold. Among our dealings with many foreign corporations, our closest relationship is with Johnson Matthey (JM), a world-renowned precious metal company in England. We have associated with JM since the Taisho era (1912-1926), and this relationship became even closer in the early Showa era, when our company imported silver coins from China and exported them as silver nuggets to JM. In 1933, US President Franklin D. Roosevelt announced that silver bullion would be purchased at the same price as US silver coins as one facet of the New Deal. Due to this, the market price of silver skyrocketed on the London market. At that time, our company purchased large quantities of inexpensive silver coins from China, melted them in Japan, and made them into consistent units of silver nuggets. These were sold daily to JM in England. Incidentally, the price of silver fell heavily at the end of 1935. JM sent a telegram just after, which contained a very favorable message. It said, "Notify us regarding how much silver Tanaka possesses. We will buy the entire quantity at the price before the drop." Another time, when our company imported some high-quality (99.95% purity) platinum from JM, we told them that "99.9% purity is fine-please reduce the price accordingly." JM replied, "Because we have set work standards, foreign matter must be added to platinum to give it a purity of 99.9%. This makes the price rise accordingly." Through transactions such as these, the two companies’ spirits of sincerity and trust further strengthened the bond between Tanaka and JM. Later, we concluded an exclusive agency contract for thermocouples with JM in 1956. 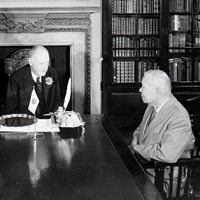 Tanaka Matthey (the current Tanaka Kikinzoku International), an import sales company for precious metal products for industrial use, was also established in 1969 through fifty-fifty joint investments. When it was established, our company was quite small. Including clerks and apprentices, we had approximately 10 shop employees, 10 factory employees, and four craftsmen who did ornamental metalwork. Before becoming a precious metals dealer, Tanaka Precious Metals was a money changer that exchanged loose change and collected scrap silver and metal currency, which was then refined into pure gold and silver and sold to parties such as goldsmiths. However, money changers required large amounts of funds in order to handle expensive products, and they had to borrow capital from banks to do so. To that end, many money changers ended up closing their shops because they were struggling to repay their loans. Fortunately, our company was able to pay bank interest with factory processing fees, but the management of this business was certainly not easy. 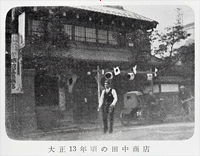 Shortly after the Taisho era began (1912), our company transformed itself into a bullion dealer. The reason for this was because Tanaka Precious Metals had a factory for processing precious metal bullion. The first-generation Umekichi Tanaka gradually made the switch to a management policy that used factories for industrial manufacturing, rather than the money changing business which brought little profit. This transformation from being a money changer-a trade that focuses on commercial profit-to a bullion dealer aimed at industrial profit was in line with later trends of industrialization in Japan, and met with success. In particular, Tanaka Precious Metals was the only company in Japan that possessed the technology for platinum refining, so it was in great demand.